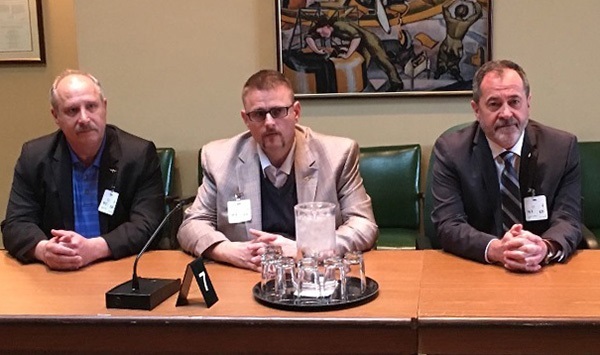 A 22-member IAM delegation to traveled to Ottawa to urge the Parliamentary Standing Committee on Transport, Infrastructure and Communities to send the Air Canada Public Participation Act back to the House of Commons and include changes to protect Canadian jobs. Pictured from left: IAM District 140 President and General Chair Fred Hospes, Grand Lodge Representative and Quebec Coordinator David Chartrand and Quebec Federation of Labor General Secretary Serge Cadieux. An IAM delegation to a Canadian parliamentary transportation committee revealed flaws in a bill that would allow Air Canada to offshore aircraft maintenance work performed by IAM members. They asked that Bill C-10, or the Air Canada Public Participation Act, be sent back to House of Commons with recommendations to ensure the survival and growth of the aircraft Maintenance Repair and Overhaul (MRO) industry. The 22-member IAM delegation urged the Committee to send Bill C-10 back to the House and recommended changes in the section concerning maintenance activities and asked that the jobs be kept in Canada. The IAM also urged the government to continue to invest in and support the MRO industry. The IAM is the largest union at Air Canada representing 8,000 workers. Although the company has offshored heavy aircraft maintenance, highly skilled members currently maintain the carrier’s fleet on the flight line at facilities across Canada. The legislative changes offered by the IAM would protect those jobs and could promote a return of maintenance to the country.